You may remember about a week ago when we covered a story about the miBook, a PDA that was an instruction book with digital video capabilities. One of the most practical uses for the miBook is for cooking, but this Pandigital Kitchen Technology Center (KTC) is designed specifically for the kitchen. 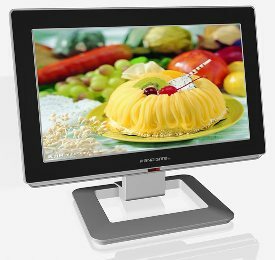 The KTC has a 15 inch (1280 x 720) touchscreen that allows the user to access recipes at one touch. The KTC comes loaded with several recipes pre-programmed in the unit itself. If you want to get even more experimental in the culinary arts, use the device to get on the net and find more recipes. It has about 1 GB worth of memory, which is enough for several MP3s. Not only is it capable of playing music, but it will do pictures, videos, and it will even support HDTV playback. Now you can entertain yourself as you cook. I think that a device like the KTC will be very useful in busy kitchens at home or in restaurants. No more putting cookbooks down on dirty counters and getting them stained. Of course, a touchscreen could can easily smudged. You should be able to purchase the Pandigital Kitchen Technology Center in August for about $400.